By winning the 2001 Final, Steve Okonski joined Heikki Thoen and Kevin Quirk as repeat Rail Baron champions. No tournament at the WBC has more repeat champs than Rail Baron, a testament to both the enduring popularity of the game as well as confirmation of what we already knew: that skill, not luck, is dominant in this game. The 6-player Final also saw the return of two other players from the 2000 Final: Chuck Foster and Mark McCandless. Rounding out the group were Eyal Mozes, Stan Buck, and Inger Henning. Alternates Chuck and Eyal advanced when Doug Galullo, Brian Bouton and Ron Secunda were unavailable. Assistant GM Paul Van Bloem kindly oversaw the final and recorded its details. 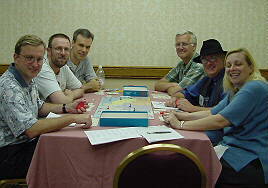 As in the 2000 Final, all six players survived without going bankrupt, but unlike 2000, railroad auctions and sell backs played a major role in the outcome. At the end, only Mark had a fully interconnected network, and Chuck nearly achieved an amazing victory with a network consisting of but two unconnected railroads. During the first round, one player quipped "Rail Baron is a Scary Game." Well, in a 6-player final, Rail Baron is a Brutal Slugfest. And, that's how we like it. Turn order was Mark, Eyal, Steve, Stan, Chuck and Inger. Despite the availability of the Home Swapping variant, all the finalists retained their assigned Home Cities. Eyal was first to arrive, and used his $4,500 payoff to purchase the B&M. Stan was next and opted for the NYNH&H. When Chuck arrived, he purchased nothing, and was thus able to afford the PA upon his second arrival. Eyal arrived again, and snagged the NYC, even though it was a monetary stretch. Later that round Steve selected the B&O and Stan the C&O. By the time both Mark and Inger had completed their cross-country trips to Los Angeles, the NorthEast had sold out, so they bought the SAL and ACL respectively. On the trip to his third destination (Boston), a couple of low movement rolls exhausted Eyal's cash, and he was forced to auction his B&M. Steve captured it for $11,500. Suddenly Boston was unfriendly for Eyal, which set him back an additional $10,000. By the end of the round, Steve was in good shape with the B&O, B&M, WP and an Express, while four other players had just one railroad and their original locomotive. He came up a couple of dots short of solidifying his position via the AT&SF, which was recently purchased by Stan. Steve settled for the UP instead. Meanwhile, both Mark and Inger had departed Los Angeles for another cross-country trip. Their NorthEastern destinations had long ago been locked up, and they were forced to pay use fees. Thanks to the always helpful PA, Chuck collected from both. Mark then began a series of shorter trips which gave him desperately needed purchase opportunities. 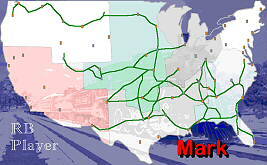 He managed to patch together a decent network with good coverage in the SouthEast and access to the NorthWest. 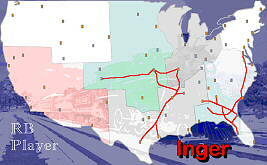 Unfortunately, Inger continued to get long trips, and had few chances to purchase good railroads. Stan filled in the gaps in his network with help from the CMStP&P, on which so many players were established that he collected $1000 payments at least 10 times. Meanwhile, Eyal and Chuck focused on the race for the SP, the last of the Big Three. Chuck arrived in unfriendly Dallas and employed the daring move of buying the SP even though it meant he would not have enough cash left to pay his pending railroad use fees. He proceeded to auction the D&RGW, but most players were low on cash, so Mark was able to claim it for just $7,000. When Chuck's turn was over, all the railroads had been sold and the match was 2.5 hours old. Player holdings were as follows: Mark: SAL, SLSF, CRI&P, D&RGW, NP, T&P; Eyal: NYC, SOU, GN; Steve: B&M, B&O, N&W, GM&O, UP, WP; Stan: NYNH&H, C&O, IC, AT&SF, CB&Q, CMStP&P; Chuck: PA, L&N, SP; Inger: ACL, RF&P, C&NW, MP. Chuck had hoped the D&RGW would sell for more; when he came up $500 short on his next trip, he sold back the L&N, severing his network, and seemingly dooming his chances in the match. Mark was next to arrive and grabbed the L&N before Chuck could repurchase it. No other railroads changed hands until close to the end of the match. The city access and monopoly percentages were as follows: Mark 50.0%, 5.1%; Eyal 39.85%, 0.0%; Steve 48.0%, 4.3%; Stan 59.3%, 1.62%; Chuck 49.0%, 0.0%, Inger 29.4%, 0.7%. Eyal was the first to upgrade to a SuperChief ($28,000), with all the others except Inger doing the same a few rounds later. The networks of Stan, Mark and Steve offered the best map coverage and connectivity, and therefore the players appropriately rode the railroads of others whenever possible. Chuck in particular was the main beneficiary when several players made west coast trips via his SP rather than Stan's AT&SF. Meanwhile, Steve had collected no railroad use fees from others since near the start of the match, and had not paid any out. That changed radically mid-game when Mark visited Pocatello, and Stan, Inger and Eyal in quick succession visited Las Vegas, cities monopolized by Steve's UP. However, almost simultaneously, Steve visited three consecutive unfriendly destinations himself. Steve was first to announce reaching $150,000, followed almost immediately, and to the surprise of the group, by Chuck. Chuck soon collected a $27,500 payoff, to put himself within single-trip range of victory. Steve was first to cross over $200,000, but Chuck managed to get a series of short trips between the NorthEast and NorthCentral to destinations served by his PA. Before long, he was just a few dots from Chicago where the payoff would put him slightly over $200,000, and where he'd be just 6 dots from his Pittsburgh home. If Chuck tossed a 6 bonus on his next turn, he'd be able to arrive, then declare and bounce out to home to win. His roll gave him plenty to reach Chicago, but only a 5 bonus. In the vicinity Chuck owned only the PA, and therefore he was unable to wander to consume the bonus die without paying $10,000 (which would drop him below $200,000). So, Chuck headed directly into Chicago via the PA, and thought long and hard about whether to declare with that bonus bounce of 5. Inger sat 10 dots away (but had only a Standard engine), Mark 11 and Steve 16. Chuck boldly declared, and moved his pawn to the western suburbs of Pittsburgh, just one dot from pulling out an amazing victory next turn. Inger rolled too low, but Mark's dice totaled 16, more than enough to make a rover play on Chuck and collect $50,000, which put him close to $200,000. The B&M that Steve had acquired at auction finally paid for itself (and more) when Inger visited Portland. That money pushed him far enough past $200,000 to afford the trip home to New York, but Steve opted to not declare when departing unfriendly Jacksonville. The excitement from the climactic rover play a moment earlier was quickly dispelled because Steve then rolled New York (his home) as his next destination. Two turns later he arrived and declared without danger of rover to capture his second consecutive Rail Baron crown. The order of finish of the others (based on net worth) was: Mark, Stan, Chuck, Eyal and Inger. Because five of the six players had unconnected networks, a huge amount of cash changed hands during the final: over $1.2 million! Income, payouts and net cash flow for each finalist was (in thousands): Mark $211 in, $209 out, +$2 net. Eyal $219 in, $336 out, -$117 net. Steve $190 in, $100 out, +$90 net. Stan $164 in, $120 out, +$44 net. Chuck $270 in, $147 out, +$123 net. Inger $147 in, $279 out, -$132 net. This year saw a slight decrease in the number of people playing Rail Baron, but it remains one of the most popular WBC games. 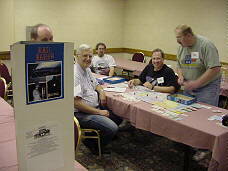 We were saddened by the loss of longtime Rail Baron player, and 2000 finalist, Malcolm Robinson who succumbed to illness only a few weeks before the WBC; may he always roll boxcars. In all, 56 different people played 22 first-round matches which produced 20 different winners (both Assistant GMs Paul Van Bloem and Chuck Foster won two first-round matches). For the semi finals, 19 of the 20 showed and top alternate, Mark McCandless, advanced by virtue of 16 Bonus Points. The Bonus Points experiment, which awarded the most points to the tables that finished the quickest, appeared to be a success. The average match duration was cut by about 30 minutes as compared to the prior year! In the total of 27 matches played, the railroads most often owned by the winner were the NP (16 times), N&W (13) and PA (12). What is the N&W doing on this list? The curse of the C&O continued: it was owned by only 2 match winners. The IC and MP were next with 3 winners each. Of the big western railroads, AT&SF was the most frequently winner-owned (11). Prizes were awarded in grab-bag fashion at the start of the semi-finals. The Casey Jones Award (most unfriendly destinations: 17) went to Philip Evans. Stan Buck was the Efficient Engineer with his victory with the lowest cost network ($102,000). Bob Foster took the Riches to Rags Award by managing to survive to the end of a match with just $14,500 net worth. John Haas and Chuck Foster shared the Long Haul award by visiting just 17 destinations while winning. Doug Galullo won the JP Morgan award with the highest net worth ($463,000). And, Charles Davis was named Sportsman for his persistence and cheerfulness despite coming up just shy of advancing to the semi finals yet again this year. We hope to see you in 2002! 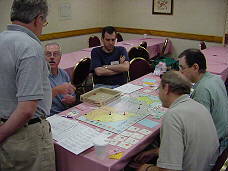 About 75 people are expected to compete in the 11th Annual Rail Baron tournament at the 2001 World Boardgaming Championships (WBC) this summer near Baltimore. You don't need to be an expert to join the fun: beginners are welcome (game rules). To answer repeated requests, this year we are adding an evening heat of Rail Baron (RBN). A "thank you" goes to Merchant of Venus (MOV) GM Greg Mayer and Empire Builder (EPB) GM Rich Shipley for juggling their schedules to make this possible without time slot overlap. I expect the Thursday evening heat will be the busiest one due to fewest timeslot conflicts with other games frequently enjoyed by the same crowd. As in prior years, this year's tournament will use MESE format. This means you can play in any or all of the three first round heats. The top 25 to 30 first round winners advance to the semi-finals. The top six semi-finalists advance to the final. The exact number of players per table at the first round, semi-final and final levels will vary based on the total number of participants. Ideally, each first-round heat will feature multiple 4-player tables, the semi-finals will consist of six 5-player tables, and the final will be one challenging 6-player table. With this arrangement, to be crowned champion, you will need to win a 4-, a 5- and a 6-player match. For the semi-final round, a we will try to assemble 5-player matches. The table matchups (player groups) for the semi-final matches will be based on AREA rank as of late June (the higher AREA rated players will compete against the lower). Players without AREA ratings will be placed after those with, and will be ranked according to total Bonus Points accumulated during the first-round heats. NEW THIS YEAR: BONUS POINTS! Bonus Points will be employed to determine alternates for the semi-final matches. Alternates will be advanced to the semis to bring the quantity of players to a number evenly divisible by 5 (probably 25 or 30). Bonus Points reward those first-round players who 1) play the fastest, and 2) play in the most heats. Bonus Points will be awarded as follows: for each first-round heat, each player at a table receives points equal to the number of tables at that heat less the number of tables that finish the game before them. EXAMPLE: if the first heat has eight 4-player tables, each player at the first table to finish will be awarded 8 points; each player at the next table to finish will be awarded 7 points, etc. The last table to finish is awarded just 1 point per player. For fairness, a 1-hour adjustment factor will be applied to any table with 3 or 5 players. Adjudicated tables will receive 1 point per player. The idea behind Bonus Points is to encourage all players to move faster. The faster you play, the better your chances to advance to the semi-finals. Please note the GM reserves the right to make changes to this plan should the number of participants vary substantially from that anticipated. The exact schedule is determined by the BPA; the durations are estimates. The prizes will be awarded using a grab-bag format at the start of the semi-final round. Steve Okonski is GM. Chuck Foster and Paul Van Bloem are Assistant GMs. #1 - SuperChief engines will cost $0: Once you have an express, you can upgrade to a Superchief for free. Note that you will still need to use a purchase opportunity to perform the upgrade. If you want to jump directly to a Superchief (without an Express) the cost will be $40,000. Tests with the RB Player computer software indicate this reduces the average game duration by 20%. This rule will be used for the first round only. For subsequent rounds, the Superchief cost will be reduced per Optional Rule 2 in the RBN rules. #2 - Roll 3 with a SuperChief: If you do not have a Superchief, and are entitled to a bonus die, the bonus die must be rolled after you have completed movement for the normal roll. Once you have a Superchief, you must roll all three dice at once, and then use them all for movement. #3 - Modified enforcement of "roll-and-move-immediately": This courtesy rule stipulates that once you roll the dice, you must start moving your pawn immediately. However, this encourages players to think of a route for all possible dice rolls prior to rolling, instead of just the single route for the actual roll. This pre-planning for all possibilities slows down the game. Instead, here is how we will play: 1) a player rolls the dice, 2) the player can count dots and decide what route to employ, 3) however, once the player begins to move his pawn to a rail dot (i.e. moves it to the next dot), he must continue without stopping all the way until he consumes the dice roll (or arrives). The penalty for stopping mid-route will be to lose this turn; the player's pawn should be returned to where it started this turn. Furthermore, the penalized player must pay the bank the current unfriendly RR use fee (either $5000 or $10000). The penalty will be invoked if more than half the remaining opponents in the match agree that the player stopped in mid-route. #4 - Home Swapping: This rule greatly reduces the chance that a player will have the poor luck of getting an easily monopolized first destination. It helps give everyone a fair start, and works as follows. After a player has determined his first destination, but before he rolls to begin movement, he may state he is Home Swapping. This simply means his first destination becomes his home city, and his home city becomes his first destination. He freely teleports his engine to his new home city, then proceeds normally (rolls dice for movement, etc.). For use fee purposes, assume the player is established on whatever RRs serve his new home city. For victory purposes, he must return to his new home city. Note that this variant makes it possible for two or more players to have the same home city. More details. All these special rules are supported by the RB Player computer shareware. And, yes, the computer version makes a good enough opponent to help prepare you for the tournament, even if you've never played the boardgame itself. Review the boardgame rules summary. If you arrive at your destination on the normal dice, and the bonus die is pending, you get to roll for your next destination and "get the bonus out" (use the bonus die to begin the next trip). Note that with a Superchief engine, you roll the normal and bonus dice together. Therefore, if you "get the bonus out" you use that die to start your next trip; you do NOT re-roll the bonus die. Per BPA rules, no "cheat sheets" or electronic aids may be used during tournament play. However, the replacement destination and payoff chart distributed free by ICI is approved for use. Any dice that roll on the floor must be rerolled on the table. Any dice that are leaning on the edge of the board game must be rerolled. Reroll only those dice that did not sit properly. Consider rolling within the box top to help avoid these problems. Cash may not be kept hidden from view of opponents, but may be placed in a single stack in front of the player. You do not need to tell opponents how much cash you have, unless you have $150,000 or more and an opponent asks. Upon reaching $150,000, you should announce this to the other players. For more rules interpretations that will be employed, see the Rail Baron FAQ. Please be on time. Late arrivals may lose their right to participate in that heat or round, and will be accommodated only to facilitate the filling of a table to the desired number of players. A player is considered late if he has not submitted his badge to the GM for the round signup when the GM has finished badge processing for all the players already present and waiting to start. Please be courteous to your opponents, and do not quit a game in which you are playing. However, if your match is running longer than the expected duration (4 hours for the first round, 5 for the semi-final) and another tournament for which you have pre-registered is about to start, you may leave provided that 1) you locate someone to take your place, and 2) you have the permission of the GM or an Assistant GM. Once you have left a match, you may not rejoin it; the results are credited to your record, not that of the substitute. Failure to abide by these guidelines will disqualify you from playing in another RBN game at the WBC. Alternatively, if a match is running longer than the expected duration, the GM (or acting GM) will adjudicate it (declare the match ended, and pick a winner) upon request if more than half the remaining players in that match wish so. At his discretion, the GM may also adjudicate a match that is running longer than expected. The GM's decision is final. Adjudicated tables will receive 1 Bonus Point per player. Due to time conflicts with other games, it is likely one or more semi-final and final slots will be unclaimed. For example, in 1998, two of the six final slots were unclaimed and were filled by others. Thus, even if you did not win during the prior round, but have a high Bonus Point total (for the semis) or net worth (for the final), you should check in because you might advance. If, after 15 minutes past the scheduled start time of the round, there still remain open slots, these slots will be offered to physically present RBN players in order of AREA rank. Bonus Points (described above) will encourage all players to keep their table moving, and help speed up the game. An evening heat has been added to accommodate players who have other obligations during the day. Prizes will be awarded in "grab-bag" format at the start of the semis.